Their manner of fighting, being in large measure that of wild beasts and frenzied, was an erratic procedure, quite lacking in military science. Thus, at one moment they would raise their swords aloft and smite after the manner of wild boars, throwing the whole weight of their bodies into the blow like hewers of wood or men digging with mattocks, and again they would deliver crosswise blows aimed at no target, as if they intended to cut to pieces the entire bodies of their adversaries, armour and all! Celtic born are physically fit; be it lithe and nimble or large and brawny - their bodies are shaped by a lifetime of fighting and surviving. Aside from their physical prowess, there is another thing that sets the celtic born apart from other humanoid races - Their shamans paint intricate patterns on each tribe member who has come of age, each and every pattern unique. It is speculated that the spirits of the deceased or perhaps the Gods themselves guide the hand of the shamans into these patterns, connecting the fighter with his ancestors. This religious ritual is important, if not the most important, part of the preparation for war. The bright blue warpaint is made up of woad and lard. The woad is corrosive - it contracts the skin, getting the adrenaline pumping for battle and in many cases, it even scars the skin over, causing many warriors to be permanently marked by their unique patterns. Their ever-present warpaint has earned them the name "Pict Warriors", which derives from an ancient language, meaning "Painted Warriors". They are often found wearing tunics made of wool or linen, with simple armlets. Their winter attire includes a heavy cloak as well, with a rim of animal fur. These cloaks are often adorned with a brooch in the shape of their tribe sigil that holds it together. You are the result of generations of conflict - born and bred for battle, you stand tall in the face of adversity. Your kind has adapted to the harsh wilderness they have always called home. 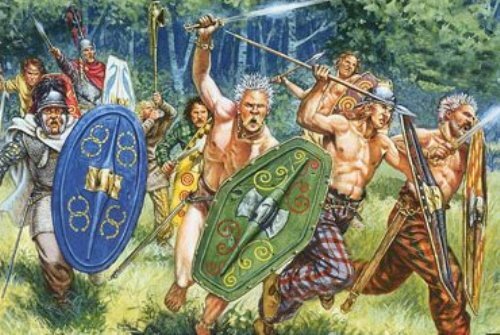 While they often live far from other races, different celtic born tribes often fight amongst each other; these raiding and hunting are not done for territorial gain or to exert political control, but for sport. Celtics strongly believe that the head is the seat of the soul and thus, when a raid is over, the heads of their fallen allies and personal foes alike are collected. The heads of allies are placed in purpose-built temples in the village, adorned with candles and riches to aid the passing into the afterlife. Meanwhile, the heads of foes are nailed to walls or left dangling from the saddle of a horse. The weapons of the enemy are ritualistically broken and buried in a mass grave alongside their bodies. Tribes strongly depend on nature and have a great respect for the spirits around them. While men are the primary hunters and protectors of the tribe, women are well versed in the art of battle, with all youngsters being trained and encouraged equally from a young age. As soon as a child’s physical prowess and personality have developed, they are tested in a series of tasks alongside their peers; these may include but are not limited to; joining in a hunt lead by an adult, fighting each other in hand-to-hand combat or applying each other’s first warpaints. These rites of passage do not only instate them as fully functional part of the tribe but also serve as training for their future roles in the tribe. Each tribe consists of a trinity of forces: The Warrior, the Seeker, and the Shaman all play their part, not only in battle but in everyday life as well. The role of a seeker is reserved for those who are lithe and nimble. They prefer to take a stealthy approach to war, taking on the role of a scout who seeks out enemy encampments. In society, they are the hunters, providing meat and fish for the tribe. Outside of their hunting activities, they can be found doing a variety of odd jobs for the tribe which ranges from repairing armor to cooking to standing guard and tending to the horses of the tribe. A warrior lives a simple life; they train for a large portion of the day. This training seeps into their work as well; they often work in construction and smithing - work that requires a lot of heavy manual labor. Their hulking bodies are often far larger than those of their tribemates and they put it to good use. In battle, they stand at the front lines, be it on horseback or on foot. Amongst these warrior-filled tribes, there are those who are far more attuned to nature; the tribe's Shamans have long since surpassed human abilities in spells and nature. They commune with nature spirits and animals alike. These animals often are found comfortably walking the village, unharmed by anyone in the tribe. Shamas spend their days collecting and grow various herbs and berries to use in potions and salves. While many shamans often partake in battle in the back line, the part they play starts long before the battle and ends only when they have tended to all the wounded after the said battle. Curiously, the role a youngster will take on in the tribe seems to be determined at birth; Warriors are born large, heavy and with a surprisingly strong grip for their tiny baby fingers. The physical differences between Seekers and Shamans might be harder to distinguish as both are born small. It is said animals are immediately drawn to the cradle in which druids lay though, protecting them from birth. Seekers physically develop faster than both the other subraces - they master a stumbling walk before many druids or warriors have learned to crawl. The role of a child is not determined by the parents but seemingly at random. The chance on each subrace is equal, ensuring a tribe will never lack one of the cornerstones of its trinity. Celtic names derive from old Common words. These words are often related to nature or battle like Cillian ("War" or "Strife"), but can be descriptive, such as Cael, which means "slender or narrow" or Kamren, which means "crooked nose". Your celtic born has several traits as a result of their ancestry and ancient bond with nature. Age. Celtic born mature at the same rate as humans and due to their attunement with nature, it is not uncommon for celtic born to live up to 120 years. Alignment. While most celtic born are neutral good, those who leave the tribe may lean on chaotic neutral, as they value their own freedom and refuse to respect authority outside of their own chieftains. Size. Ranging from 5'4 to 5'9 feet tall a celtic born's muscular body usually weighs more than their average height's let on. Your size is Medium. Ancestral Link. At 1st level, you have only just begun to learn your pattern. The woad bites into your skin harshly, causing your adrenaline to start pumping through your veins. Your base walking speed is 35 feet. Starting at 3rd level, you have fought many battles since your warpaint was first applied. Your skin has long since scarred over and has become numb to the pain of its corrosion. As an action, you can channel the spirits of your ancestors within yourself, causing the warpaint that once covered each of your honored ancestors to become visible throughout your body. Your transformation lasts for 1 minute or until you end it as a bonus action. During it, your walking speed increases by 5 feet, you gain temporary hit points at the beginning of each of your turns equal to your proficiency bonus and once on each of your turns, you can deal extra damage to one target when you deal damage to it with an attack or a spell. The extra damage equals your level and the damage type is that of the attack. Once you channel the spirits of your ancestors, you can't do so again until you finish a long rest. Attunded. Celtic born are have a natural connection to nature and their lifestyle, as well as cultural values, leads to them being a race with a greater understanding of the environment. You are proficient in the Nature skill. Toughness. Your natural athleticism and primal lifestyle grants you increased fortitude. Your hit point maximum increases by 1, and it increases by 1 every time you gain a level. Languages. You can speak, read, and write in Common and one other language of your choice. Warriors may learn the language of a creature they regularly hunt like goblinoids, kobold or even giants. Seekers may learn the primary or secondary language of nearby settlements to better converse with their neighbors. Shamans often learn Sylvan or Primordial to better connect with the natural world. Subrace. The ancient societal roles passed down from one generation to the next has led to three main subraces: Warriors, Seekers or Shaman. Choose one of these subraces. Warriors are amongst the strongest of the tribe. They rely on their raw power to get them through each battle. Bestial Strike. When you score a critical hit with a weapon attack, you can force the struck creature to make a Constitution saving throw to avoid being knocked prone. The DC for this saving throw equal to 8 + your Strength modifier + your proficiency bonus. Seekers are fast and nimble and are better at remaining stealthy, making up for their lack of raw strength with agility. Focused Rush. When you score a critical hit with a weapon attack, you get a surge of adrenaline and you can move up to your movement speed without provoking attacks of opportunity. Shamans are completely attuned to nature. They often prefer communication with animals over humans. Woodland Bond. Through sounds, gestures, and ancient hymns, you have the ability to communicate in a limited manner with beasts and plants. They can understand the meaning of your words, and if able to may respond in a limited manner. A flower may bend in the direction of what you seek and an ocelot may guide you out of the depths of the forest. 5′ 1″ +2d6 100 lb. × (2d4) lb.